There are numerous personal finance decisions we have to make at every stage in our lives. In Singapore, we have to make some of these decisions at a certain age either due to government policies and/or restrictions. We look at how Singaporeans need to navigate key personal financial decisions in their lives to ensure they plan forward and make prudent choices. Think of this article as the “Game of Life” of a Singaporean making personal financial decisions in his or her life. Even before you can start talking or walking, your CPF accounts will already be created for you when you are born. As a brand-new Singaporean, you will receive a MediSave grant of $4,000 to start paying for your own MediShield Life premiums (enough until you turn 21), as well as Integrated Shield Plan premiums and approved medical expenses. Compulsory education kicks in for you. You have to attend a national primary school as a pupil, unless you have been granted an exemption, to attend Designated School or to be home-schooled. From 2019, even children with moderate to severe Special Education Needs will be required to complete Compulsory Education. 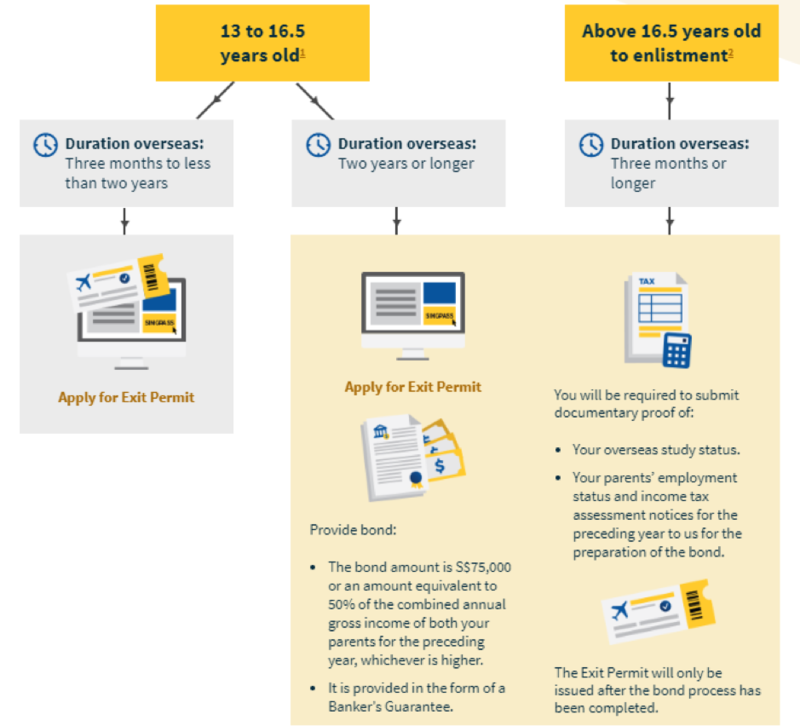 For all male Singapore Citizens and Permanent Residents, you need to take note of your exit permit and bond requirements if you are leaving Singapore for more than three months after you turn 13. This is a consideration if you are intending to study abroad before you enlist for National Service (NS). At 13, you are also legally able to start working (with restrictions) in Singapore. When you turn 16, you can work in Singapore as an adult without any special restrictions. You can open a Central Depository (CDP) account once you turn 18. This enables you to start investing in stocks and bonds on the Singapore Exchange (SGX), Singapore Savings Bonds (SSBs) and other relevant financial instruments. You become an adult at 21. This means you start being able to vote in elections to decide how Singapore should be governed. This also means you can get married, without requiring parental approvals, and apply for your first BTO home. At 21, you can also start applying for your first credit card. However, you will likely only be able to continue applying for student credit cards as you would not likely have started working and earning a wage. It is also when you turn 21 that you can apply for most other banking services, such as car loans, home loans, personal loans and others. Many Singaporeans would already be working in their first or even second jobs by the time they turn 25. This means they should have some ideas on how to upgrade themselves or if they want to seek a new career path. Thankfully, as part of the government’s initiative to promote lifelong learning, all Singaporeans receive $500 in SkillsFuture credits to use on training courses of their interest when they turn 25. CareShield Life will compulsorily and automatically kick in for all Singaporeans turning 30 from 2020. CareShield Life is Singapore’s long-term care insurance scheme providing financial aid to those afflicted with severe disability. At age 30, your PSEA or post-secondary education account will also be closed. Any remaining funds in this account will be transferred to your CPF Ordinary Account. You can also apply to be a taxi driver only upon hitting 30. Interestingly, this restriction isn’t imposed on private hire car drivers. Of course, you now also look vastly different to when you first received your Identification Card (IC). This is a good time (and also a compulsory time) to get a new IC. Turning 35 can be a little less depressing for singles! You can now finally buy an HDB flat on your own. When you turn 35, your CPF allocation rates also change. While you still contribute 20% of your salary and your employer still contributes 17% of your salary into your CPF accounts, how they are split into the individual account change. A lower percentage (21% compared to 23%) goes into your CPF Ordinary Account, while more is channelled into your Special and MediSave Accounts to bolster your retirement and medical needs. For enlisted men and specialists, you have now “MR-ed” (put into Mindef Reserve list), which means you no longer have to go back for reservist. As depicted in the graph above, your CPF allocation rates change again, with more emphasis on your retirement, via your Special Account, and medical costs, via your MediSave Account, and less on your housing needs, Ordinary Account. Apart from when you turn 35, this also happens when you hit 45, 50 and 55. Retirement is on the cusp – your CPF Retirement Account (RA) is opened for you. You are also able to withdraw a minimum of $5,000 from your CPF accounts. Once your RA is opened, your combined balances in your Ordinary Account (OA) and Special Account (SA) balances will be transferred in. At this juncture, you have to decide on your retirement sum – Basic Retirement Sum, Full Retirement Sum or Enhanced Retirement Sum. When you turn 55, your total contribution to your CPF account decrease from 37% to 26% – your employer contributes 13% (4% lower) and you contribute 13% (7% lower). This 11% decrease in wages show that companies need encouragement to continue keeping ageing workers in their teams. Two weeks before you turn 60, you can apply for your senior citizen concession card. This allows you to travel on Singapore’s public transport at subsidised fares. Your CPF contribution rates go down again, from 26% to 16.5%, with employers paying 4% less and employees contributing 5.5% less. At 60, you will no longer be covered by the Dependants’ Protection Scheme (DPS), which is an opt-out term insurance scheme automatically extended to eligible CPF members, offering coverage of a maximum sum assured of $46,000. You’ve reached the official retirement age in Singapore. Fret not, there’s no real need or requirement to retire immediately, and you can continue working until the re-employment age. Read Also: What Is The Difference Between Retirement Age And Re-Employment Age In Singapore? You can choose to enter the CPF LIFE scheme and start making monthly withdrawals. Alternatively, you can wait till you turn 70 before joining CPF LIFE. If you choose to enter CPF LIFE, you need to decide between three available plans – the Basic Plan, Standard Plan and Escalating Plan. You also have the option to withdraw a lump sum of up to 20% (which includes the $5,000 that can be withdrawn at 55) of your Retirement Account savings when you reach 65. Depicted in the chart above, your CPF contribution rates go down again, and for the final time, when you turn 65 – you know it, retirement is in the next few years. It decreases from a contribution rate of 16.5% of your salary to 12.5% of your salary. Of this 4% decrease, employers pay 1.5% less, while employees contribute 2.5% less. At 65, you can also tap on the HDB Lease Buyback scheme, unlocking value in the HDB flat you are living in by selling extra years of your HDB flat lease that you will unlikely need. This is when the re-employment age ends in Singapore. This doesn’t mean you are not allowed to work anymore, it just means employers are not obliged to offer you employment even if you are fit enough to work. You also stop paying for CareShield Life premiums at 67, but continue to receive lifelong coverage. You must start making CPF LIFE withdrawals, if you haven’t already started at any point after turning 65. Congratulations! You’ve beat the average life expectancy in Singapore – which currently stands at 83.1 years old, according to the Singapore Department of Statistics. You will soon be joining an exclusive club – there are about 1,100 centenarians in Singapore. Many of your term insurance plans will lapse between the age of 99 to 101. This means even though you’ve been paying your insurance premiums all along, your family will not get an insurance payout after you pass on. This isn’t as bad as it sounds, you shouldn’t have any dependents or family members relying on your insurance payouts to get by after you pass on. Living past 99 years should not worry you as CPF LIFE will continue giving you a monthly payout regardless of how long you live.